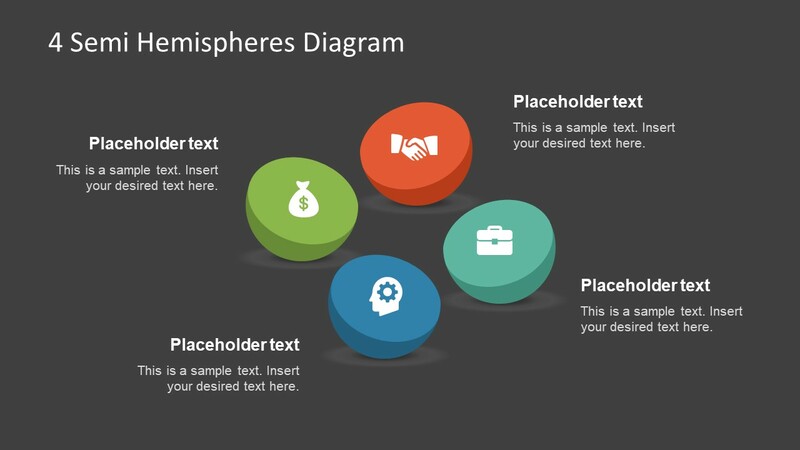 The Free Semi Hemispheres Diagram for PowerPoint is a creative 3D concept design. It is a 4 step PowerPoint diagram in the shape of hemispheres. Instead of using full circle segments, the 3D view of half-circle or hemispheres design can demonstrate the models more effectively. It is an ideal template to display the earth crust structure. However, the editable clipart icons enable users to produce more graphic presentations relevant to their topics. The free PowerPoint provides two slides of distinct background versions. For example, the plain white background slide to use in light theme presentation. Whereas, the black background template shows how the diagram may appear in darker layout presentation. 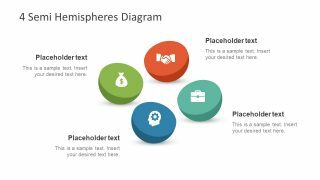 The semi hemisphere design PowerPoint diagram with two free slides show the value of contributing elements. Such as the icons to present the generic business processes. Like finances, partnership, development, and progress. These graphics of sphere in PowerPoint are the clearest way to explain the complex situations. Similarly, the 3D elements can illustrate the company’s mechanism and operations. With very little knowledge and experience, the users can quickly make changes in the content of text placeholder. Addition to the simplicity, the 4 steps semi hemisphere diagram in PowerPoint assists the audience to quickly understand a concept. 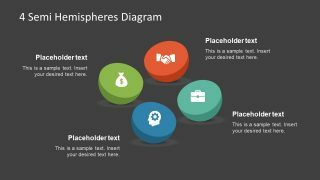 The Free Semi Hemispheres Diagram for PowerPoint shows four segments as two halves of a sphere. Each hemisphere has assorted colors and clipart icons. These are the editable 3D sphere PowerPoint where users can make changes into the design, color, and size of 3D objects. For example, modifying the surface and semi-circle side of the segment by changing the colors. Notice the difference of shades in 3D view of the hemisphere which is editable from shape fill menu in drawing format. Also, the icons and hemispheres are flat vector shapes of PowerPoint. Hence, the rescale of objects will not affect the image quality.